Orange County Mayor Teresa Jacobs congratulates the fifth graduating class from the Orange County Experience program. The Orange County Experience, an 11-week educational program about Orange County Government, graduated its fifth class on Dec. 5 at the Board of County Commissioners Chambers. 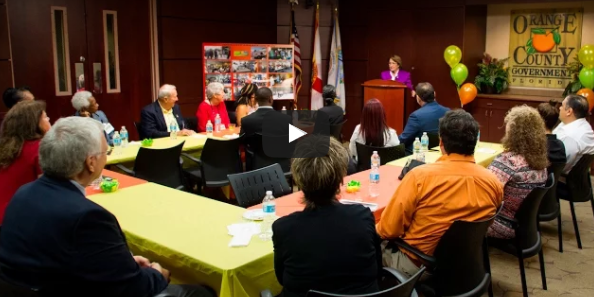 The program, which kicked off this year in September, annually provides citizens and community leaders the opportunity to learn more about Orange County Government and the vital services the County provides to the region. Orange County Mayor Teresa Jacobs provided welcome remarks and congratulated the new Orange County Experience graduates. This year’s graduating class consisted of more than 20 citizens who received a behind the scenes look at the internal operations of Orange County Government, from technology and infrastructure to neighborhoods and health and family services. Orange County staff provided more than 30 hours of presentations and facility tours, including the Medical Examiner’s Office, Animal Services, Fire Rescue and Parks and Recreation. Graduates of the program often go on to serve on the County’s citizen advisory boards and continue their service through other volunteer opportunities. As the community faced a challenging year with issues including the Zika virus, the Pulse nightclub tragedy and Hurricane Matthew, participants gained valuable insight into the important work Orange County employees perform daily. “From our deeply committed first responders, to the compassionate medical staff in our Medical Examiner’s Office, as well as our planning and environmental experts, or those caring for abandoned or lost pets, Orange County is home to some of the most devoted public servants you will ever meet,” Mayor Jacobs said. Cathy Alphin and her husband, John, were among the graduates of the program and decided to enroll because, after recently moving to the area, they wanted to learn more about how Orange County functions. To view photos from the 2016 Orange County Experience graduation, visit Mayor Jacobs’ Flickr album.